For a town that is basically flat, Albany has a surprisingly many miles of trails suitable for negotiating on a mountain bike. This is one of them. It’s the Oak Creek Greenbelt Trail in the southwest corner of the city, skirting the subdivisions off 53rd Avenue S.W. As you can see, it takes the visitor through the wooded bottomlands along the creek for which it is named. There are a few obstacles, such as a ford that is inundated even at the end of a dry summer. But it’s easy to ride, with a few interesting ups and downs. To get there, you follow 53rd to near its western end and watch for the sign shown here. This is not the only Albany trail of its kind. 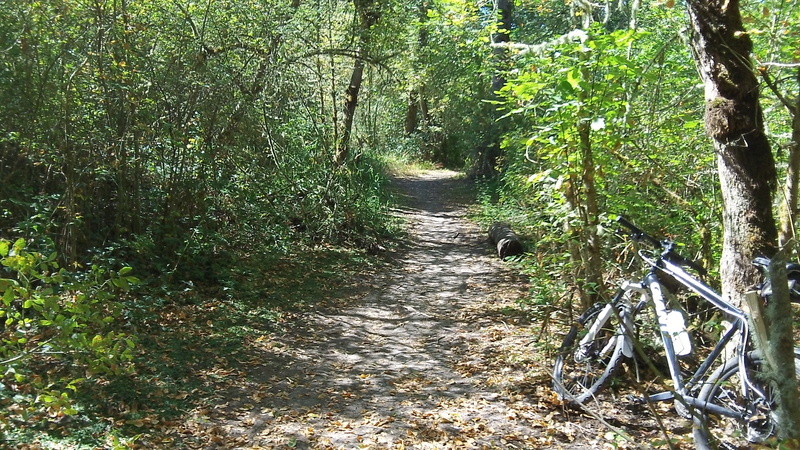 Just as wooded and seemingly miles from nowhere — even though just minutes away — are the Simpson Park and Takena trails on opposite sides of the Willamette River, each extending about a mile and a half or more downriver before ending in a handy turn-around loop. The spelling of Takena (it has no h) has been fixed in this version. 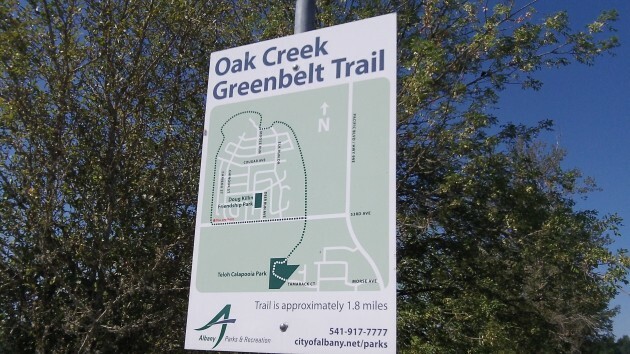 Please keep in mind that this trail runs parallel to some of the homes in the neighborhoods and we request that you follow the rules regarding your animals. Our backyards are NOT open to animals, which has been a problem in the past. The ordinance clearly states the animal should be within 10 ft of its owner and on a leash. FYI: Horses are NOT allowed on the trail! We want this trail to be enjoyable for humans and their small domestic animal as well as the people who live here. Thank you. Maybe the name has been changed recently, but isn’t Takena Trail also known as Eagle Trail? At one time, there was a sign with that name, and I believe it said that Eagle Scouts maintained it. But I don’t remember seeing that sign the last couple of times that I have been on the trail. I clearly remember when it was known as the Eagle Trail, from the contribution to the project by an Eagle Scout troop(s) at its inception, if memory serves. That the city, at some point, renamed it to fit their “theme” doesn’t surprise me. Mr. Hodney either forgot, or didn’t know the history of that trail I have walked and ridden many times since the early 1990’s.